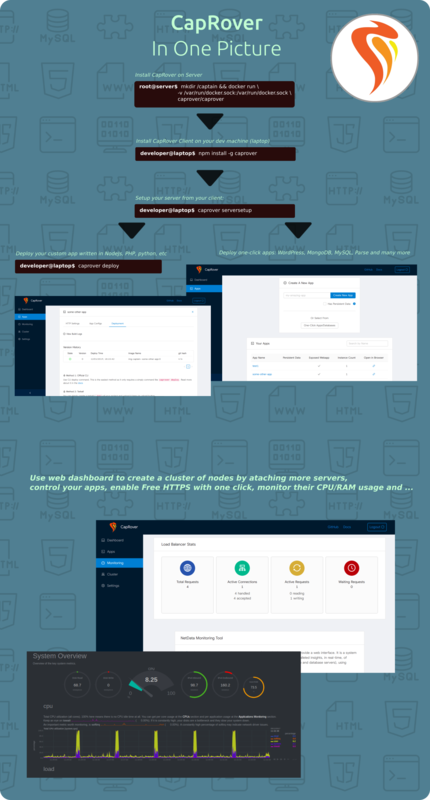 CaptainDuckDuck · Build your own PaaS in a few minutes! CaptainDuckDuckBuild your own PaaS in a few minutes! DEPRECATION NOTICE: CaptainDuckDuck is now updated, rebranded and distributed as CapRover. See CapRover.com for details. 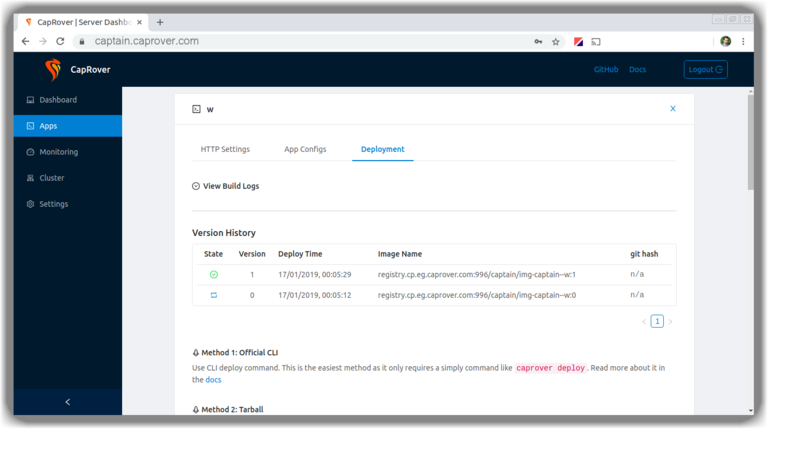 Captain is an extremely easy to use app/database deployment & web server manager for your NodeJS, Python, PHP, Ruby, MySQL, MongoDB, Postgres, WordPress (and etc) applications. It's blazingly fast and very robust as it uses Docker, nginx, LetsEncrypt and NetData under the hood behind its simple-to-use interface. does not like spending hours and days setting up a server, build tools, sending code to server, build it, get an SSL certificate, install it, update nginx over and over again. enjoys a platform where installing MySQL, MongoDB and etc on their server is done by selecting from a dropdown and clicking on install! 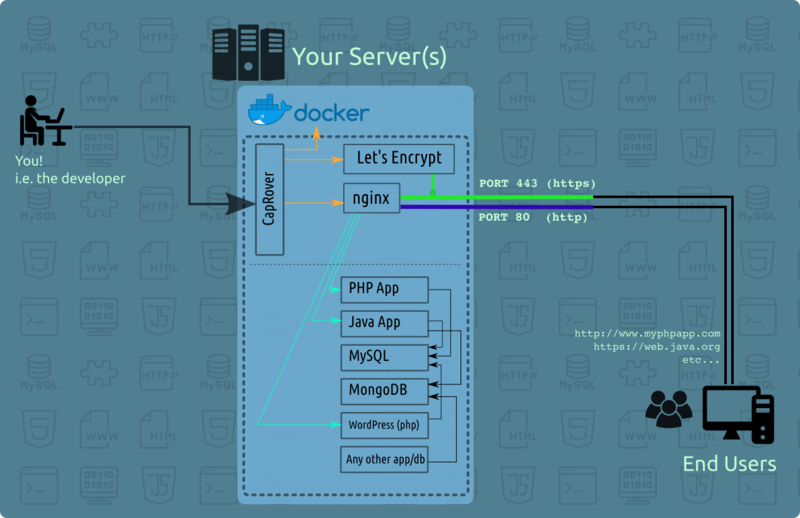 likes to enjoy the power of Docker and nginx without having to learn them or deal with their settings scripts to make things work!! Ability to secure your services over HTTPS for FREE, ability to automatically redirect HTTP to HTTPS. Deploying one-click apps is a matter of seconds! MongoDB, Parse, MySQL, WordPress, Postgres and many more. Simple interface for many docker operations: exposing container ports to host, setting up persistent directories, instance count and etc. Optionally fully customizable nginx config allowing you to enable HTTP2, specific caching logic, custom SSL certs and etc. Attach more nodes and create a cluster in seconds! Captain automatically configures nginx to load balance. Focus on your apps! Not the bells and whistles just to run your apps!